The award-winning fine arts department offers a wide variety of classes for every skillset, ranging from beginner to advanced in each of the 5 disciplines including: voice, instrumental music, dance, theatre, and visual arts. Students may take general classes like studio art, beginning band, or HS drama or highly specialized courses like tap, ballet, honors musical theatre, and sculpture. The department marries technology and the fine arts in graphic design and digital photography classes. Each discipline offers unique opportunities to explore the material outside of class in extracurricular activities as well.  The Faith Lutheran Conservatory of the Fine Arts offers students comprehensive performing and visual arts majors in a multi-disciplinary setting. Students have the opportunity to major in dance, instrumental performance, technical theatre, theatre performance, visual arts, and vocal performance. Faith has a remarkable staff and award-winning programs. 9-12 graders may audition to gain admittance into the Conservatory after which they will have a wide array of classes to choose from taught by knowledgeable instructors as well as professionals in the fields of the arts. It is the goal of the Conservatory that students who want to pursue the arts after graduation have the foundation of talent, passion, dedication, and the skillset to do so. The music program at Faith Lutheran offers students from all skill-sets the unique opportunity to learn and hone their crafts in both instrumental and vocal performance. The instrumental program is for students in 6-12 grade from beginning band for students who are just learning to Symphonic band, which includes those students mastering their instrument(s). Students may also participate in jazz band, praiseband, Handbell Ensemble, and marching band. With a traveling piano lab, state of the art band room, and concerts, the instrumental program offers a chance for brand new musicians to find their talents as well as Conservatory students to hone their skills so they may pursue music after graduation. For those students wishing to study vocal performance, Faith Lutheran also has an award winning program offering choir and women’s/men’s ensemble. Students in 6-12 grade may participate in choir. The music program has traveled all over the world competing both nationally and internationally. The music program opens a doorway to membership into Tri-M, the National Music Honor Society. The Visual Arts Program at Faith offers students many opportunities to learn new and exciting media. Students may learn ceramics, sculpture and glass working all utilizing the state of the art gas and electric kilns. They may paint, sketch, and draw. Faith also has a photography program that utilizes the latest technology and a dark room where students are able to develop their own film. A graphic design class shows students the unique way modern technology marries with fine art. Students with varying abilities in grades 6-12 may participate in the visual arts. Those wishing to take their skills to the next level may choose to audition for the Conservatory. The visual arts program opens a doorway to the National Junior Art Society and the National Art Honor Society. Please visit us at ARTSONIA to view a wide selection of our student artwork. Search for Faith Lutheran Middle School and High School and view art slideshow or by gallery. Faith Lutheran is proud to offer a wide array of dance classes in both Middle School and High School. For 7th and 8th graders Dance 1, Dance 2, and Musical Theatre Dance are all year round courses which provide a sampling of choices for High School classes. Class selection for high school expands with Ballet 1/2, Ballet 3/4, Ballroom 1/2, Ballroom 3/4, Tap 1/2, Tap 3/4, Dance 1, and Dance 2/3, and Elite Dance. High School dance classes can be taken for Fine Arts or Physical Education credits. For the more serious dancer, Faith Lutheran offers a Dance Major within the Fine Arts Conservatory. Dance Majors will audition for the program where upon acceptance, they are required to take 2 dance classes at Faith as well as train at an additional studio 36 hours a semester. Performance opportunities include the Annual Fine Arts fundraiser, Chapel, and select assemblies. It is Faith Lutheran's mission to integrate education, technique, and passion for dance, creating a well rounded dancer.